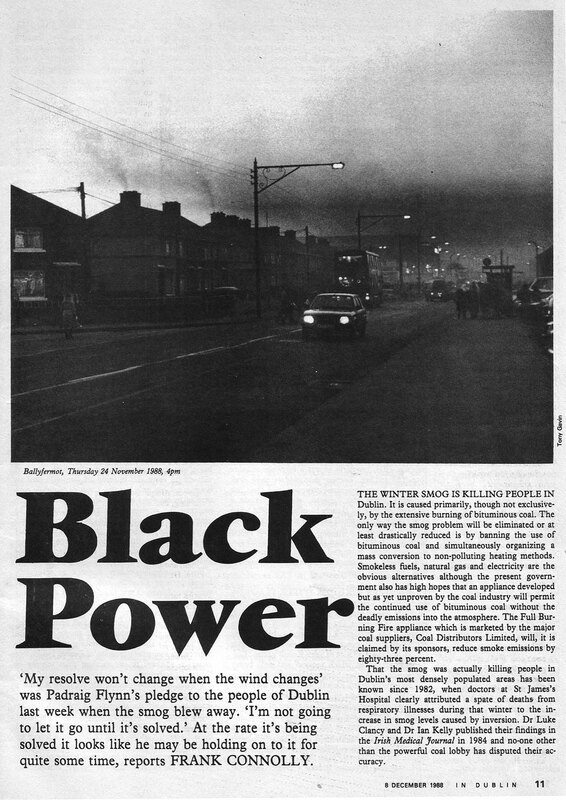 The ban on the marketing, sale and distribution of bituminous fuel (or ‘smoky coal ban’) was first introduced in Dublin in 1990 in response to severe episodes of winter smog that resulted from the widespread use of smoky coal for residential heating. This measure was deemed particularly innovative at the time, as it adopted a market intervention approach to regulate commercial operators rather than regulating emissions from householders in their home. The ban proved effective in reducing smoke and sulphur dioxide levels and was subsequently extended to other areas. The ban now applies in twenty cities and towns. Air quality monitoring by the Environmental Protection Agency (EPA) has shown levels of particulate matter (PM10) are lower in these areas than in towns where the ban does not apply. A carbon tax will apply to solid fuels in Ireland from the 1st of May 2013, which is expected to promote a further incentive to shift towards low-carbon and less polluting fuels in the residential sector. On 2 April 2012, Minister Hogan announced a public consultation to inform and assist a review of the ‘smoky coal ban’ regulations. The purpose of the review was to ensure that the regulations remain fit for purpose in safeguarding air quality by limiting harmful emissions of air pollutants arising from the use of residential fuels. The consultation paper reviewed the regulations to date and identified relevant considerations relating to their effective implementation in the context of developments over the two decades since the ban was first introduced in Dublin. Following the review of submissions received under the consultation process, several proposed enhancements and new initiatives were identified to improve the effectiveness of the existing legislation so as to consolidate air quality benefits to date, and deliver further improvements across the country into the future. Under the new Regulations the smoky coal ban will further be applied to the following towns with effect from 01 May 2013. A ban on the burning of smoky coal and other prohibited fuels now applies in all smoky coal ban specified areas to complement the ban on the marketing, sale and distribution. There is a range of innovative smokeless solid fuel products, including smokeless coal products, available on the market. Smokeless solid fuel is cleaner as well as more carbon and heat-efficient.so can deliver climate benefits as well as improved air quality and human health benefits. Under the Regulations all smokeless solid fuel products must be clearly labeled as “SMOKELESS FUEL”. This allows householders to make an informed choice concerning the products they purchase. The Regulations continue to be enforced by local authority authorised persons. Authorised persons may undertake inspections of premises and vehicles being used for the sale and distribution of solid fuel as well as collect samples. A local authority may bring a prosecution under section 11 of the Air Pollution Act 1987 for breaches of the Regulations. Under the Environment (Miscellaneous Provisions) Act 2011 the maximum fine amounts for breaches of the Regulations have been increased to 5,000 euro on summary conviction. Fixed payment notices (or ‘on the spot fines’) were also introduced for alleged offences relating to the marketing, sale and distribution of prohibited fuels in specified areas. Persons found to be marketing, selling or distributing prohibited fuels in breach of the Regulations are now liable for a fixed payment notice of 1,000 euro. Local authorities submit reports of inspection activities to the EPA Office of Environmental Enforcement, which has an oversight role. Complaints regarding the marketing, sale, and distribution of prohibited fuels or smoky emissions from the use of prohibited fuels in smoky coal ban specified areas should be reported to the environment section of your local authority. Monitoring data from the Environmental Protection Agency has shown notable changes in both concentrations of PM in cities where the ban was introduced (Figure 1), as well as an overall fall in PM emissions from the residential sector, for the period from 1990 to 2010. These results are shown in Figures 1 and 2. Research indicated that the ban in Dublin resulted in over 350 fewer annual deaths. An estimate of these benefits in monetary terms put the value at over 20 million euro. Additional benefits of the regulations have also been identified through the stimulation for householders to switch from using solid fuels, which generally are less efficient and more polluting, to more efficient and less polluting gas and oil. The associated reduced fuel costs to consumers were estimated at 184 million euro per year. Modelling of this measure is reasonably straight forward. Sales data can be used to ascertain the level of impact on the national demand for smoky coal, and the shares of the associated activity in the modelling process can thereby be adjusted. Alternative fuel choices should be picked up in the parallel national data. Dependent on the perceived level of compliance and reports from enforcement teams, the impact may be adjusted over time. Emission factors may be determined from associated legislative data, inventory sources and the EMEP/EEA Guidebook. SWiFT 7:2011. Verification of environmental parameters for bagged coal supplied to the market in Ireland. NSAI, Dublin. Clancy, L et al (2002). Effect of air pollution control on death rates in Dublin, Ireland: an intervention study. The Lancet. 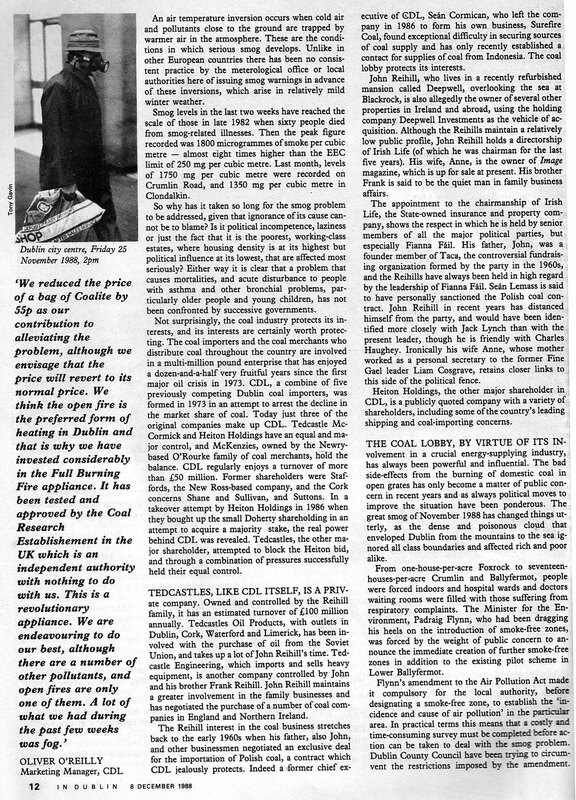 Clinch JP, McLoughlin, E. (2001) Air pollution in Dublin – preliminary analysis of the effects of the ban on bituminous coal. University College Dublin. Goodman, G. et al (2009) Effect of air pollution controls on black smoke and sulphur dioxide concentrations across Ireland. J. Air & Waste Manage. Assoc. Lewis, O et al, (2008) Emissions from Irish domestic fireplaces and their impact on indoor air quality when use as supplementary heating source. UCD. Global NEST Journal, Vol 10, No 2, pp 209-216.